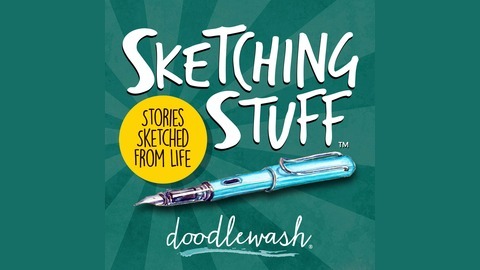 I’m Charlie O’Shields, and just three years ago, I started sketching and painting with watercolor and became so hooked that I created a little blog called Doodlewash. It’s since grown much larger over the years, featuring posts from hundreds of artists all over the world, and in many ways it’s your usual art blog. Until I show up and start sketching stuff and rambling on about life, creativity and other little things that come to mind. Most of which have more to do with life in general than art itself. Being a bit shy, I’ve never appeared on video like so many of my artist friends, so I thought I would start with audio and sharing, not my paintings, but the stories they inspired. Many filled with facts you didn’t even think you needed to know, others a bit autobiographical, and some just plain fun. 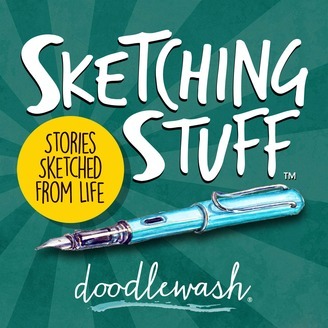 Welcome to Sketching Stuff, a collection of stories sketched from life.